The broadcaster blamed a rogue member of the technical staff. THE BBC HAS apologised for a floor plan which referred to Northern Ireland’s Minister for Education John O’Dowd as Sinn Féin/IRA! 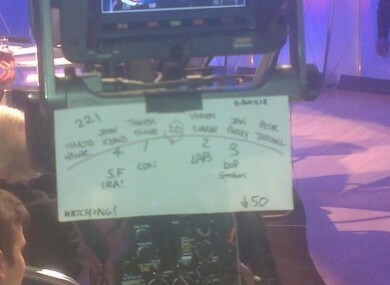 The broadcaster blamed the presence of the note on one member of Question Time’s technical staff in the Belfast studio. He had attached the clip board to a camera to detail the position of the panel guests on Thursday evening. It was only meant for his own personal use, explained the BBC which also described the sign as “inappropriate, insensitive and extremely naive”. The image was made public by audience member Simon Whittaker who also pointed out that another guest was labelled as the “DUP goodies”. The picture was subsequently tweeted by Martin McGuinness who asked for an explanation for the “pathetic floorplan”. O’Dowd said: “The ‘SF/IRA’ tag was one created at the height of the unionist murder campaign against my party colleagues in the late 1980s and early 1990s. It was an attempt to justify attacks on Sinn Fein members and our families. For the BBC to adopt the tag 20 years into a peace process is beyond belief. The BBC subsequently said it was “very sorry for any offence caused”. “The note was written by one of the technical staff on the programme for his own use. “It was not authorised or endorsed by anyone on Question Time. The person responsible has been left in no doubt that it was inappropriate, insensitive and extremely naïve. Question Time is produced by Mentorn Media. Poll: Is Alan Shatter’s position as minister untenable? Email “BBC 'very sorry' for offence caused by SF/IRA jibe”. Feedback on “BBC 'very sorry' for offence caused by SF/IRA jibe”.